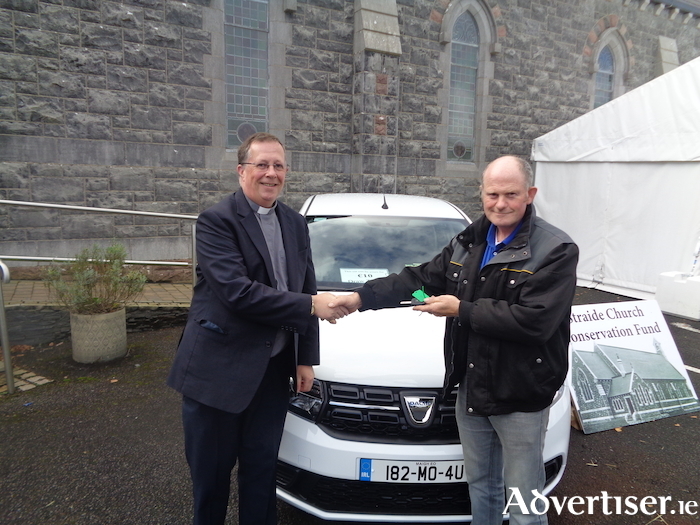 Fr Martin Convey hands the keys to the brand new Dacia Sandero car to William Doherty, Straide, who won first prize in the recent Church Conservation Fund draw on behalf of Straide Church Fundraising Committee. The local community in Straide and donors from further afield, who have contributed to the fundraising efforts for the Straide church conservation fund have helped the fundraising drive reach a total of €137,995 to date. The recent grand prize draw raffle which took place on Saturday September 8 raised €102,796 alone. Speaking on behalf of the fundraising committee Fr Martin Convey expressed his sincere thanks to all involved: "First and foremost, sincere thanks to our very generous parishioners and businesses here in Straide whose encouragement and support was second to none, as was the support received from the Friends of Straide Parish throughout Ireland, the UK and the USA." He thanked, in particular, the very dedicated and hard-working fundraising committee 'who were out selling tickets all over the country in all sorts of weather conditions during the past six months, adding: "They really have excelled and exceeded all expectations. The same committee organised a very successful line-up of events during the Harvest Festival Week leading up to the night of the big draw and put a huge amount of work into those events as well." Community members were delighted to have the Mayo Person of the Year 2018, Sr Maureen Lally (who launched the initial fundraising drive in March ) present on the night of the draw to act as independent-supervisor and to pull the lucky winning tickets. Page generated in 0.1640 seconds.